The A Muse calendars come with colored month names, but I knew I wanted to use the Ambrosia paper from Basic Grey and it wouldn't be matchy matchy if I had colored names, so I had a light bulb moment and went and printed out the A2 calendar in BLACK AND WHITE! By doing this, you can use ANY color combination you want! YAY for versatility! 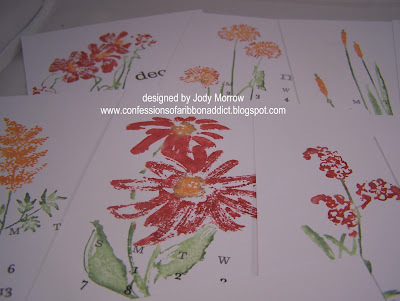 I used my SU markers to color directly on the rubber of the flower stamps. 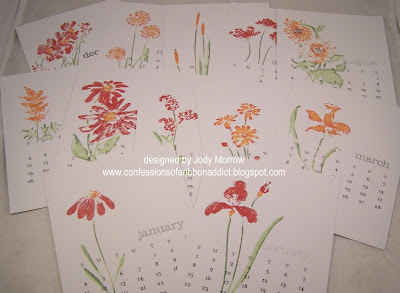 Then, I misted with water and stamped one flower per calendar page. 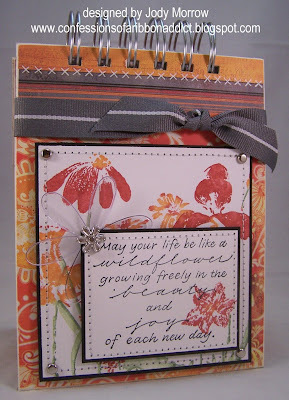 I stayed within the colors of the Ambrosia paper pack which was pumpkin, grey, red and I just had to use green for the stems... they are flowers... forgive me! LOL I decided that the pages needed to be reinforced, so I added a 3/4 inch piece of matching patterned paper to the top edge of the calendar pages where I would be punching with my Bind It All. I overlapped a few of my stamped images when doing this. 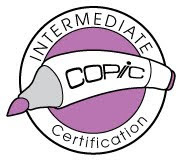 Next time, I will adhere the paper first, then stamp. 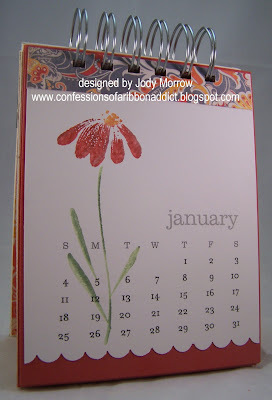 :) I used my SU scalloped edge punch to scallop the bottom edge of each calendar page. 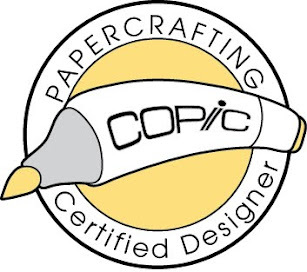 NOTE: when using the scalloped border punch, CENTER the piece of card stock you are wanting scalloped and then move left and right. This will ensure that the scallops end up even on the ends. You wouldn't want half a scallop on one side and a full one on the other would you? That just looks WEIRD! LMBO! I matted each page of the calendar to card stock and then punched the holes in the top with my Bind It All! Man, I have used that a lot this past week or so! :) It's a good thing I have a life supply of coils huh? LMAO! I adhered patterned paper to the front and back covers. I added a sweet sentiment to the cover. I think it is fitting for the calendar since it refers to beauty and joy of each new day! :) Awwwww! *warm fuzzies* I finished off the front cover with some ribbon and Doodlebug rub on stitches (unfortunately my Janome won't stitch through mat board! LMBO!). The focal piece was embellished with real stitching, silver brads, a SU flower brad and a Heidi Swapp ghost shape. I hope you have enjoyed my projects today and I hope you have taken the time to go make a small donation for the Leukemia & Lymphoma Society. OMGosh Jody, these are absolutely GORGEOUS! and thanks for the inspiration - I've got lots of flowers too! I had a block because I don't have stamps for every occasion/season and didn't know how I would make the calendar work. Wow - your projects have been incredible!! I love all of them. I will definitely donate for such a great cause!! 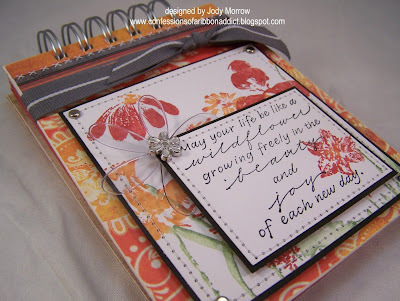 Love all your calendar projects Jody!! This one in particular is GO-JUS! My oh my oh my!!! I *LOVE* this!!! 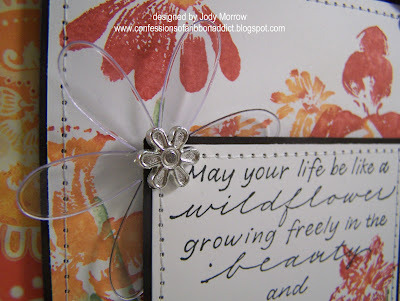 I would love to find the flower stamps so I could attempt to recreate this (in different colors, perhaps - though this color combination is just unbelievably gorgeous!) and give it to my parents for Christmas! 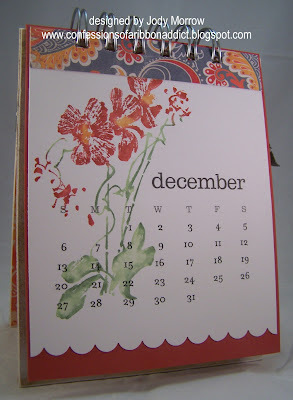 How wonderful the brushstroke flowers work with the calendar pages! Beautiful!!!! What wonderful projects! They are all fabulous, but this one has got to be my favorite! Love the colors and the flowers are beautiful! WOW!! This one is awesome. Excuse me while I pick my chin off the floor!! Beautiful work my friend!! OMG I've loved each and every one of these! You're amazing. Oh my gosh this is just GORGEOUS!! You are evil though... well ok, you are GOOD to make me want to go and buy a calendar, but evil because now I also really want a Bind it All!!! LOL! Oh. My. Gosh. I'm HYPERVENTILATING HERE! Seriously, don't give it away. Sell it to me, LOL! It would be perfect in my office! Holy WOW girl!! This is AMAZING!!! I love it!! OMG, this is the most splendiferous thing I've seen in a long time! Simply gorgeous! WOW!! All of your projects are just amazing with the calendar!! Thanks so much for the inspiration! WOW!! I agree..all of your projects are rocking!! I love everyone of them! Thank you for all of your wonderful creations. They are all stunning and I'm off to gaze at them all one more time. Those calendar pages are B-E-A-U-T-I-F-U-L!!!! What gorgeous calendars!! Your talent inspires me! Picking jaw up off the floor . . . Absolutely gorgeous, Jody! You know I have an affinity to PB flowers, too, and adore this sentiment. Beautiful project and great way to use these calendars (if I ever get mine, LOL!). Girl you are cranking out these beautiful calendars and inspiring us all. I donated yesterday and got the A2 calendar and can not wait to make some great projects. TFS and being such a great spokes person for this charity. This is a beautiful calendar! I love the hint of the extra paper before punching your holes. Thanks for sharing. Whoa, that's one gorgeous calendar!! LOVE IT! Jody, I am amazed and inspired by your creations! You are incredibly talented! I can't pick a favorite because I love them all. Your perpetual calendar in the A2 box gave me some great ideas. Thank you for participating in the calendar project! Your calendar is just beautiful!! I love every one of your projects. I just ordered one of these calendars today, and will be making something shortly. Thanks for the inspiration! I'm so inspired by all yuor beautiful projects Jody! Each one is more beautiful than the last; Thanks for sharing, now I'm off to order my calendars! Wow, you hit the ball out of the park with this project. LUV IT! Love your calendar! 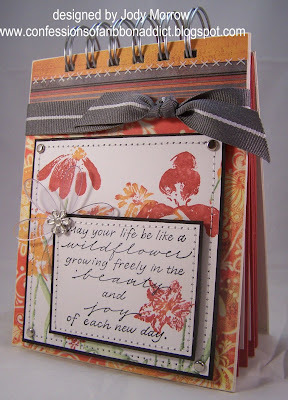 And love all your flower stamps....they look a lot like all the ones I have, lol! You have great taste, imo! Beautiful! Another project now for my poor neglected Bind It All *and* I get to do something charitable at the same time. Thanks so much! I love this idea .... yours is amazing!!! I love how it's all coordinated! This is so wonderful!! It flows so beautifully!! What a great cause to support also! 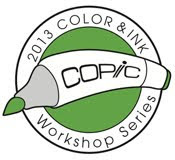 I am experiencing a bad case of bind it all envy right now. This calendar is beautiful. 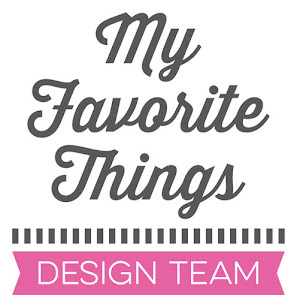 Another project I will add to my list for when my bind it all is finally delivered. Thank you for sharing. OMG this is just an awesome project... I went ahead right away and ordered the calender too... love that Penny Black Flowers... very nice color choice... soooo well done! !